Good. 0830709258 PREVIOUS OWNERS INSCRIPTION. Good. Eternity in Their Hearts by Richardson, Don, 1995-02-28. Trade paperback (US). Glued binding. 224 p.
Excellent Excellent book. everyone should read it. Especially young people. A scholarly and clearly written and well documented review. Even better than what I remember of my first reading of it 25 years ago. My highest recommendation to those to whom this topic is of interest. The premise of this book is that, embedded in most, if not all cultures of the world, are "cultural keys" which prepare them to receive the gospel. These include belief in a 'sky God', scapegoat-concept of sin-bearing, new birth rituals, and an expectation of people who will bring a book. 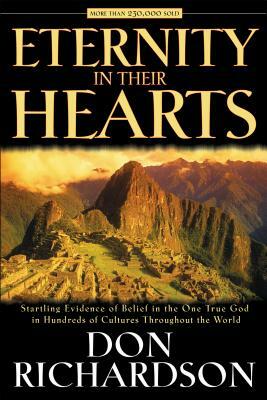 He also personally found cultural keys in a group in New Guinea where he and his wife were missionaries. Their concept of a Peace Child opened their hearts to hear the gospel. Although there is merit in such a concept, as a way to contextualize the gospel, it is not absolutely necessary as a precursor to preaching the gospel. The gospel is powerful enough on its' own, and is able to soften the hearts of lost men and women. Don Richardson offers a well-researched book that tells the truth which anthropology departments of major universities around the globe have hidden for decades: that monotheism preceded polytheism in culture, and that there was knowledge of basic biblical truth in cultures previously untouched by western culture. If you are unafraid to have your presuppositions about cultural evolution challenged, then dig into this volume, and see what your college professors kept hidden from you. What you find may change your life.